Lara turned 1 on the 7th. One! Amazing. I love making her things, at least in part because she is entirely unaware of their provenance. Plastic red tube? Love it. 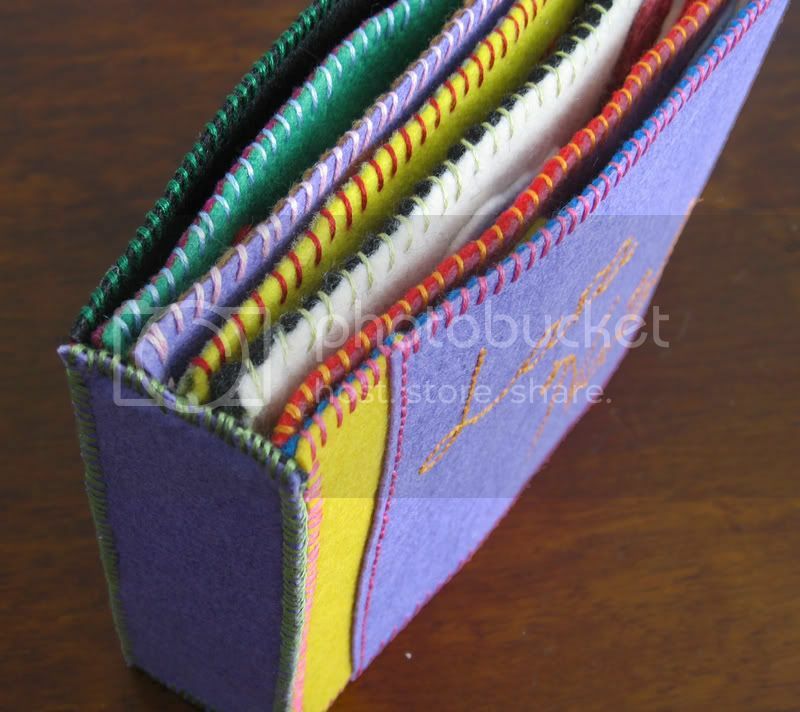 Hand-sewn, hand-embroidered felt name book? Love it. Random piece of packing cardboard? Love it the most! See all the pages on my Flickr. How did you do the binding? Was that hand sewn? Your little girl is so lucky, that's just beautiful!! Yes, the binding was handsewn - there are two layers of felt to the binding. I sewed the pages onto one, then covered it with another and did blanket stitch around them both to hide the binding seams. This book you made for your daughter's birthday is fantastic! I happened upon it and oyur blog a few months ago and today, happily, re-found you specifically because I wanted to take another look at the birthday book photos. This impressive project stuck in my mind. I hit the flickr link but I don't see them there. Are the photos still available to view elsewhere? Thanks and Happy New Year! Hey there! Thanks so much for letting me know the problem! I fixed the link to the Flickr set where this book is.